When I used to work next to Oranienburger Tor, I really enjoyed coming here and treat myself to a nice Japanese lunch. Smart Deli is a rather small place, so it can get quite crowded around lunch time. Nevertheless, the little bistro has a certain peacefulness that might help you to cope with busy Berlin. The interior is simple and tidy, yet cozy. After ordering, you’ll receive a little wooden number card that you will place in front of you when you take a seat at one of the “vintage style” tables. Just wait a short while and the friendly staff members will serve you one of the delicious weekly options you chose. Their lunch options consist of either a selection of sushi, or a non-sushi Japanese dish, such as meat or vegetables with rice. All of the things I tried so far were simply great. If you are in a rush, you can also get a bento box to take-away. If you’re up for desserts, it might be worth it trying one of the alternating home-made sweets, such as mochi ice cream or cakes. 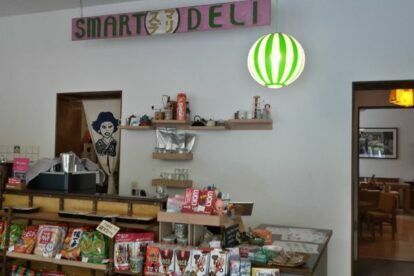 Smart deli doesn’t only serve food, however. If your meal made you feel like trying Japanese cuisine at home, you can pick up the ingredients right here. Even if you’re not the most passionate chef, you could still opt for some of the interesting snacks as a little “piece of Japan” to take home.